Leveraged loans, also known as bank loans, are now a $1 trillion market, yet the asset class remains relatively unknown to investors. That begs the question: are leveraged loans worth incorporating into your investment strategy? Let’s review the features of this asset class while also exploring its potential fit in an investment portfolio. Bank loans are issued by lower credit quality or high yield issuers. These issuers have a more highly leveraged balance sheet relative to investment grade issuers in the same sector or industry. Like high yield or junk bonds, a leveraged loan investor is taking on greater risk by lending to an already indebted firm. Senior loans are backed by the company’s assets, so they have higher claim to repayment in the event of a borrower default. Generally, senior loans are the first to be repaid during bankruptcy liquidation. It wasn’t until the late 1990s when bank loans attracted non-bank investors. Loans were syndicated by banks and were made available to institutional investors by means of standardization of documentation, which reduced the time and expense of bringing them to market. In addition, the structured vehicles market created a pool of leveraged loans to offer collateralized loan obligations (CLOs), a different type of product to offer investors. Today, two-thirds of the bank loan market are packaged in CLOs. Loan issuance has doubled since 2010 while the number of new issuers of bank loans continues to increase substantially. In fact, 2017 was another year of record issuance for the asset class. Breaking down the S&P LSTA (one of the most common leveraged loan benchmarks), we see that the number of issuers has jumped by 30% over the past five years. In the chart below, you can see the evolution of sector exposure, most notably in computers and electronics. Dive even further into this sector, and you will find that the number of issuers has doubled over the last five years, increasing from around 70 back in 2013 to 140 today. As opposed to fixed-rate debt, bank loan performance is rising in lockstep with the Federal Reserve’s tightening, which is counter to typical fixed income logic. This is because leveraged loans typically have floating rate structures which reduce or eliminate interest rate risk and reset on a regular basis. Bank loans can maintain their value and provide investors an added downside protection against rising interest rates which unsecured high yield bonds do not have. Although strong demand from investors is indicated by increased issuance, it is worth noting that uncertainty exists among investors analyzing this asset type as this is not a risk-free investment. In today’s market, the floating rate coupon structure provides a particularly compelling incentive for investors. With rates linked to a benchmark, most commonly the London Interbank Offered Rate (LIBOR), these rates typically reset on a monthly or quarterly basis. Investors can hedge against the short term rising interest rate environment currently being determined by the Federal Reserve’s tightening monetary policy. Banks loans and U.S. treasuries tend to have an inverse relationship. 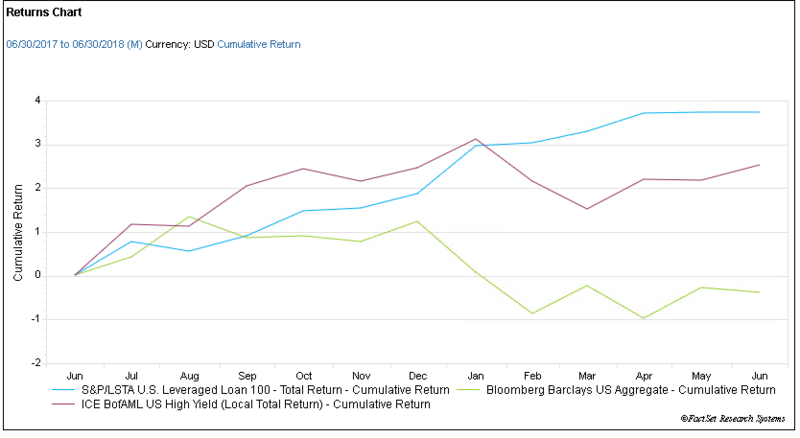 This relationship is even more pronounced over the last year, as shown in the chart below, which compares the performances of investment grade, high yield, and the leveraged loan benchmark. The S&P LSTA exhibits higher performance during a year of increasing rates and lower volatility. Continued relative outperformance by loans is likely during the remainder of 2018 as the Fed remains on track to institute another two interest rate hikes by year-end. Since the global financial crisis, when spreads widened substantially, investors' chase for yield continues, even today. The chase is reflected in today’s spreads, which have tightened to what might be the lowest levels in the past decade in most sectors. As credit investors take on more risk during this period of low default rates, there are other risks found within the credit agreements and issuers’ balance sheets in outstanding loans today. All is not necessarily rosy in the loan space though. Over the last 10 years, the loan market has rebounded along with the credit environment. However, proper due diligence is a must when it comes to higher-risk borrowers. There is a heightened sensitivity to those borrowers whose leverage is hitting 7x or 8x debt/EBITDA, compared to historical leverage highs around a 6x multiple. 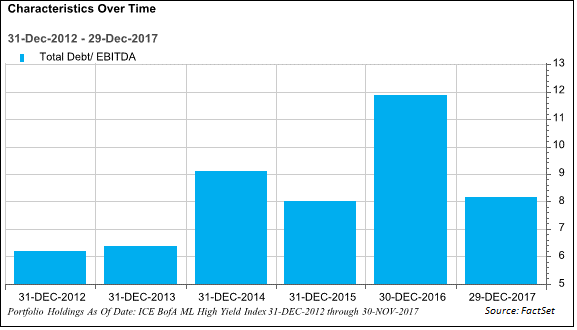 This can also be seen in the high yield bond market, as shown in the chart below of the historical total debt/EBITDA for the ICE BofA ML High Yield Index. Issuers can have aggressive add-backs to boost EBITDA resulting in an understatement of leverage that can be difficult to decipher. As noted earlier, one attractive feature for loan investors is their seniority in the capital structure for repayment; however, as more issuers only issue loans today, this makes seniority less impactful. Like most fixed income asset types, a borrower can add terms that make a loan differ from the more or less traditional senior loans. These terms are specified and agreed by both parties and these nuances of the loan structure can attract other investors. Leveraged loans can have varying levels of the lien (repayment hierarchy), covenants (restrictions on the borrower), can be restructured completely, and more. Today, more than two-thirds of loans are deemed “covenant-lite.” This means fewer restrictions on the borrower on how they use their current debt outstanding and the potential for issuance of even more debt. In the chart below, we can see this trend within the S&P LSTA benchmark over time. Whether referred to as bank loans, leveraged loans, term loans, or syndicated loans, this space continues to attract new investors and new issuers each quarter. Given that there is little indication that momentum in issuance growth is slowing, investors and analysts in the market must keep a close eye on this asset type as monetary policy tightens and geopolitical risk heightens. As markets are inherently cyclical, the window of opportunity will close at some point. 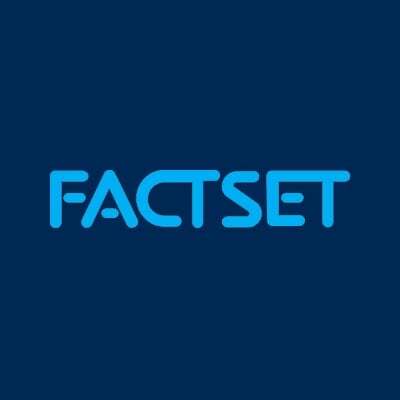 However, with default rates near historic lows and an environment of rising interest rates likely to continue, the hedging benefits and investment opportunities are clearly attractive. Investors with proper risk controls and management may well want to explore leveraged loans as a worthwhile asset class.